Sovereign – Your reliable express carrier in Europe. SOVEREIGN Speed was founded in 1998 as a neutral, independent express courier with its head office in Hamburg. From a single line-haul line from Hamburg to Brussels, SOVEREIGN soon developed into the premium supplier of urgent freight in Europe. With over 100 overnight connections and a diverse range of express handling services for time-sensitive freight, nowadays the SOVEREIGN Group is one of the key players in this segment. But not everything has changed: Despite rapid growth, we’re still a community, finding solutions together. That’s why we’re working every day towards being the most reliable express carrier offering the best value in Europe – maximum service quality at the best price. In doing so, it’s not the achievement of short-term success, but always the sustainability of our business model that is paramount. We cultivate and value fair and respectful relationships with our staff and the general public. We strongly promote fair play and good working conditions within the transport sector, create new jobs and training places, and support a number of social projects. Our staff are as unique as the SOVEREIGN Group’s line network. With their help, SOVEREIGN has grown to become the premium supplier within the European express delivery sector. Today the company has over 600 employees in seven countries. Grow with us and come on board at SOVEREIGN – the ‘Airline on the roads’. Take off with us into a shared future and become part of the SOVEREIGN family. Show us where your strengths lie. We want to attract new members of staff who take on their roles with plenty of team spirit and drive. At SOVEREIGN, having a fun workplace is the foundation for personal and business success. You can look forward to an attractive working environment in many interesting fields with challenging projects and well-organised teams. We are an innovative business and leaders in our industry. We are therefore looking for more qualified employees and managers, who want to help shape our success. What’s more, anyone who chooses to come and work at SOVEREIGN usually stays with us, as we cultivate a strong company culture with a friendly approach. The personal well-being of our employees is close to our hearts. With advice on nutritional matters, participation in running events and a gym at our Hamburg office, we help our employees to achieve a good work-life balance. There are regular get-togethers after work. There is a mixture of small parties and big events and these enhance staff relations and camaraderie. SOVEREIGN also offers an external consultation service if required, in the event of serious life situations. Furthermore, you can look forward to a number of benefits and development opportunities. We value motivated staff and as such we are always sympathetic towards requests for further training and interest in training and instruction courses. A company pension scheme, coffee for everyone and in every variety, ergonomics in the workplace, a travel allowance and fruit at workdays are other examples of staff offerings. 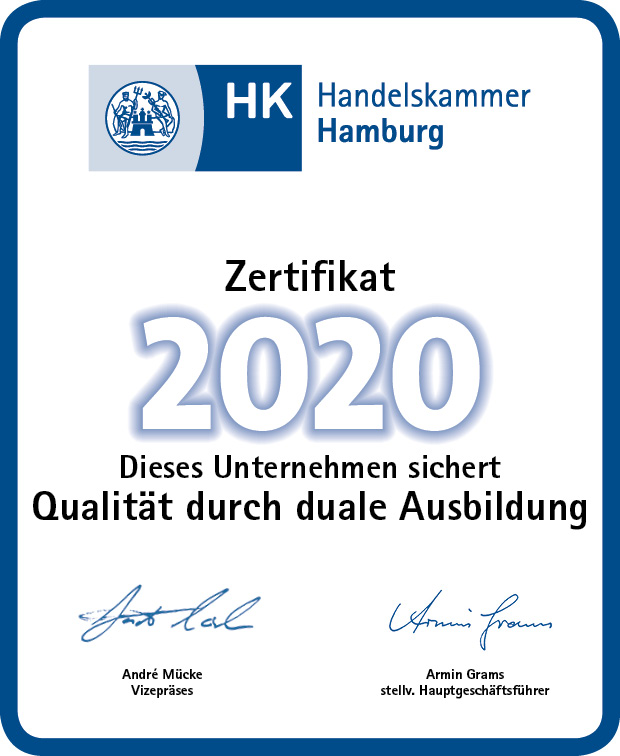 SOVEREIGN has successfully taken part on several occasions in the competition to find ‘Hamburg’s best employer’. And as a family-friendly organisation with flexible working arrangements, which are suited to your family life, SOVEREIGN is also well ahead of the pack. Are you currently unable to find a suitable job vacancy with us? Then take the initiative yourself and send us an application for your desired position. Making a big difference along with your colleagues, learning from one another and continuing to develop. These things should be your inspiration if you want to join SOVEREIGN. In order to support our diverse teams, we are seeking dedicated trainees. As an employer, SOVEREIGN offers you many development opportunities and the chance to work internationally. Send us your application and discover the SOVEREIGN world. SOVEREIGN offers you numerous training and further development opportunities ... ... for example, in the form of training courses in air safety and dangerous goods, telephone training and training in business etiquette. Our trainees get the opportunity to go on network tours and thereby become better acquainted with the other stations and their functions. You can even get your forklift licence with us – even if you’re actually completing office-based training. As SOVEREIGN operates right across Europe, we provide you with the opportunity to gain experience in an overseas station upon completion of your training course. Working environment ... ... within a team atmosphere. You will be part of a team and have a regular contact person. Your colleagues will appreciate your questions. You will work within a family-type environment – great importance is attached to helping others at SOVEREIGN. SOVEREIGN maintains a strong company culture with a friendly approach and regular events. There are regular get-togethers after work, and also regular parties, both large and small. These enhance staff relations and camaraderie. Excellent chance of being hired after your training ... ... as our training is based on our requirements. SOVEREIGN relies on its own trainees, who have already helped to shape and experienced the industry and the company philosophy and structure over the course of several years of training. We welcome your speculative applications for all other qualified jobs. SOVEREIGN is an ‘Authorised Economic Operator’ (AEO) with a ‘Customs Simplifications/Security and Safety’ AEO certificate (AEOF). Administered by the customs authorities under registration number AEO F 115697. SOVEREIGN is a member of the FRA Air Cargo Community, which promotes efficient processes, quality, safety and sustainability at Frankfurt Airport. Its work enables the successful competitiveness of the facility and efficient freight handling for customers.